The Headlight Harness is a revolutionary pet harness specifically designed to keep you and your pet safe in any conditions! 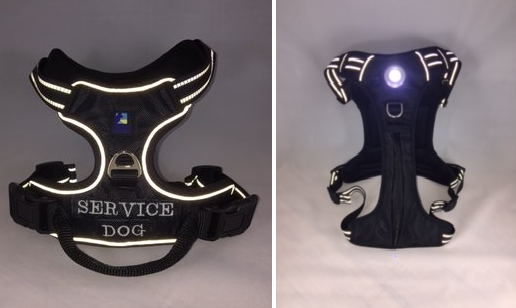 Our *Patent Pending* design incorporates numerous safety features that you can only get with a Headlight Harness, and is quickly becoming the “Go-To” dog harness for many Security Services, K9 Units, Search and Rescue Squads, and Service Dog Training Centers. Anytime, anyplace, in any conditions, the Headlight Harness keeps you safe, seen, and secure! Integrated Focused Beam LED located in the chest putting out over 85 Lumens to light up your way. Highly Reflective Trim that can be seen by vehicles from over 1000ft away . The “No Choke/ No Pull” Design reduces a dogs tendency to pull away from their owners on walks. Adjustable at all 4 straps to perfectly fit dogs up to 200lbs. Made of Light Weight, breathable materials that keep your dog calm and cool, even on the hottest days. The Sturdy handle on the back is a great for working dogs and their handlers as well as dogs “in training”. Keeps your pet safe and secure in ANY vehicle. Simply run the seatbelt through the handle before buckling them in. Perfect for dogs with deteriorating vision. The Headlight Harness. Stay Safe! Stay Seen! Stay Visible!